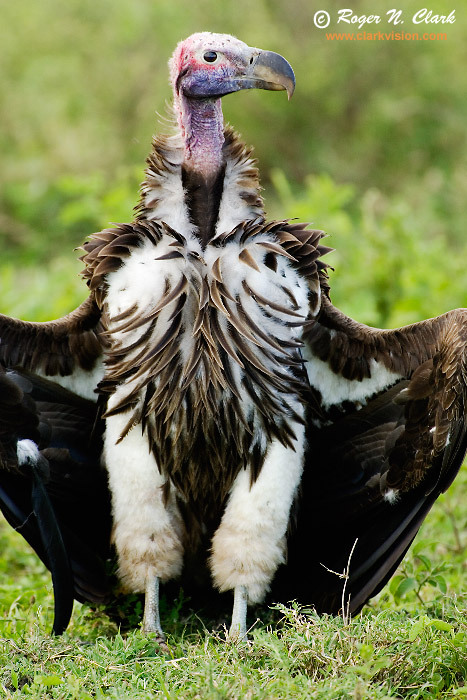 A Lappet-Faced Vulture shows how large he is to intimidate the other vultures at a gazelle kill. A hayena took the kill from a cheeta, and the vultures were moving in to get the leftovers on the Serengeti one January afternooon in Tanzania, Africa. Technical: Canon 1D Mark II 8-megapixel camera, Canon 500 mm f/4 L IS lens plus a 1.4x teleconverter giving 700 mm at f/5.6. Exposure: 1/125 second at ISO 200.